The Food Rights Network (FRN) is a non-profit, non-partisan research and advocacy project of the Center for Media and Democracy. 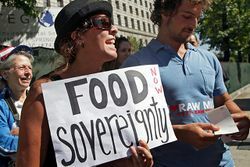 FRN supports food sovereignty. Food sovereignty is the right of peoples to define their own food and agriculture; to protect and regulate domestic agricultural production and trade in order to achieve sustainable development objectives; to determine the extent to which they want to be self reliant; to restrict the dumping of products in their markets, and; to provide local fisheries-based communities the priority in managing the use of and the rights to aquatic resources. Food sovereignty does not negate trade, but rather, it promotes the formulation of trade policies and practices that serve the rights of peoples to safe, healthy and ecologically sustainable production. - "Statement on People’s Food Sovereignty” by Via Campesina et. al. Raw milk is milk that comes directly from cows, goats and sheep. It is not modified by processes such as pasteurization and homogenization. Farmers’ practices, such as how those animals are fed, milked, and treated, along with how the raw milk is stored and transported, are critical to the quality of that milk. FRN supports the policies and practices in dairy farming that make it possible to have appropriately sized herds and pasture for grazing that will help ensure good quality milk. FRN supports practices in storage and transportation of raw milk that have made this a safe and healthy product for generations. 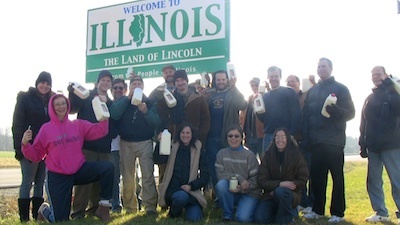 FRN supports the farmer’s right to sell raw milk to individuals and commercial enterprises both on and off the farm. FRN supports the milk drinker's right to purchase raw milk both on and off the farm. FRN also opposes the sewage sludge scam of the PR rebranding of industrial and human sewage sludge as "biosolids" and of dumping toxic sewage sludge on farms and gardens. It is FRN's position that no food should be grown in toxic sludge. "That same day that I gave her the first bottle [of formula], she had terrible diarrhea, she had horrible spit-up, she had gas, she was crying with pain. . . . Our pharmacy accidentally ordered [formula] without DHA/ARA. She had it for four days and her symptoms improved almost overnight." Isabel Salas reported to the non-profit Cornucopia Institute (Cornucopia) the difficulties she faced when her infant daughter reacted badly to a set of additives present in most baby formulas: DHA and ARA oils. Containers of formula containing these additives say things like, "Our formula is proven in clinical studies to enhance mental development" and "as close as ever to breast milk." But Salas isn't the only mother who has faced these problems. The U.S. Food and Drug Administration (FDA) has recorded at least 98 self-reported incidents (PDF) of adverse reactions in infants that could be confidently linked to intolerance to these additives, according to records obtained through a Freedom of Information Act (FOIA) request by Cornucopia in 2008. The majority of these reactions involve severe gastrointestinal distress, prolonged periods of vomiting and painful bloating. Many of these parents only found out that there was a problem with their infant's formula when they accidentally tried a brand without DHA and ARA additives. Cornucopia has called the many reports to the FDA of infants' adverse reactions to these controversial additives "only the tip of the iceberg" because "most parents remain unaware that Martek’s DHA and ARA oils may be the cause of their infant’s problems." Yet not only have these additives been approved by the FDA as "Generally Recognized as Safe" (GRAS), but they have even been approved as additives to certified organic products. They are often listed in product ingredients under the trademarked names "life'sDHA™" and "life'sARA™." Martek Biosciences petitioned the FDA for GRAS status for its "arachidonic acid-rich single cell oil" (ARASCO™, or ARA oil) and "docosahexaenoic acid-rich single cell oil" (DHASCO™, or DHA oil) in 1999. Both DHA and ARA are long chain polyunsaturated fatty acids (LCPUFAs), which when naturally present in human breast milk and in human diets, have been shown to be critical to brain and vision development (PDF). Martek owns several patents related to the process of extracting these naturally-occuring fatty acids from non-food organisms. Martek's DHA oil is an Omega-3 additive produced from algae, and its ARA oil is an Omega-6 additive produced from a fungus. These oils are extracted using petrochemical solvents (PDF, p. 2), including the potential neurotoxin hexane. "[S]ome studies have reported unexpected deaths among infants who consumed formula supplemented with LCPUFAs. These unexpected deaths were attributed to Sudden Infant Death Syndrome (SIDS), sepsis or necrotizing enterocolitis. Also, some studies have reported adverse events and other morbidities including diarrhea, flatulence, jaundice, and apnea in infants fed LCPUFAs." 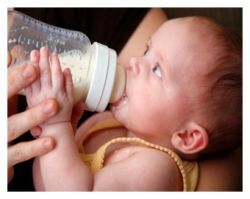 The decision notes that the approval of the ingredient does not negate the responsibility of infant formula manufacturers that include the additives to monitor and submit reports on adverse infant reactions to the FDA. However, none of the companies selling formula and other products containing the DHA and ARA oils have monitored reactions to these products and reported back to the FDA, according to the 2009 results of a FOIA request (PDF) made by Cornucopia. The 98 adverse reactions noted above were self-reported. Martek's additives are now added to more than 99 percent of American infant formulas, according to the company, as well as baby foods, supplements, milk and other food products. This includes 90 percent (in 2009) of formulas certified as organic by the U.S. Department of Agriculture (USDA). This month, the Center for Media and Democracy's new Food Rights Network launches a series of interviews with "food and farm heroes." It's easy for an organization dedicated to exposing corporate spin to focus on negative corporate propaganda with its ubiquity, but would be remiss not to highlight courageous people who fight corporate agendas and spin in other ways, large and small. Some devote their lives to it. In the world of food and farming, the contrast between corporate agribusiness "farms" and small, sustainable family farms -- farms that, to adapt a phrase of Michael Pollan's, our grandparents would recognize as food-producing places -- is especially clear. Among the farmers who live and work in these places, CMD's Food Rights Network is featuring some of the heroes: farmers who are making an incredible difference in the farming community, on our dinner tables and in the world around them. The first farmer hero we feature is John Kinsman, a dairy farmer from Lime Ridge, Wisconsin. He is a pioneer of rotational grazing, a strong proponent of small, diversified agricultural operations, and an activist since the 1970s. For more, see PRWatch, the video interview in the righthand column, the audio here and here, and the transcript. "Dishonest Fox Chart: Food Stamps Edition": According to Media Matters for America (1/30), a Fox News show run on Monday, January 30, "features mismatched data that does not answer the question of whether 'more people have gotten on food stamps' under Obama than any under other president (spoiler alert: they haven't)." Climate Change Affects Agriculture, and Vice Versa (Who Knew?! ): According to Greenwire (1/30 - subscribers only), "The World Bank's proposed agriculture-based carbon market got preliminary approval today [Monday 1/30] from a third-party carbon credit accreditation system based on the Kyoto Protocol’s Clean Development Mechanism. . . . The approval brought the bank's efforts to remunerate smallholder farmers for practicing agricultural techniques that sequester carbon in soil -- such as no-till farming, crop-residue management and agroforestry -- closer to reality. With the approval, carbon credits can be sold on voluntary carbon markets globally." However, as Carbon Trade Watch's Kevin Smith has said, "Effective action on climate change involves demanding, adopting and supporting policies that reduce emissions at the source as opposed to offsetting or trading. Carbon trading isn't an effective response; emissions have to be reduced across the board without elaborate get-out clauses for the biggest polluters." The Food Rights Network supports no-till farming, using crop residues to boost soil fertility, and agroforestry without the use of toxic herbicides and other unsustainable practices, particularly for small farmers, but believes that corporations shouldn't be allowed to buy carbon credits from small farmers instead of reducing their own emissions. Meanwhile, Public Radio International reports (1/29) that "farmers in Mozambique [are] trying to adapt farming to climate change" by diversifying the crops grown and installing irrigation, with help from the organization Save the Children. And in the United States, climate change may be threatening cranberry production in New Jersey, according to the New Jersey Spotlight (1/26). Some scientists propose "geoengineering," or "fill[ing] the upper atmosphere with tiny particles that could scatter sunlight before it reaches, and warms, the Earth's surface," as a solution to the effect of climate change on agriculture and to boost crop yields, according to NPR (1/23). Scientists working on the proposal caution, however, "Even if the global average remained the same, some regions might get hotter while others get colder. That could cause drastic local or regional changes in climate and weather patterns." And the New York Times Green blog also published an article about agriculture and climate change, on January 19. "The Scary Danger of [Big] Meat (Even For Those Who Don't Eat It)": According to AlterNet (1/30), "antibiotics are routinely given to livestock on factory farms to make them gain weight with less feed and keep them from getting sick in confinement conditions. But the daily dosing, at the same time it lowers feed needs, lowers drug effectiveness and produces antibiotic resistant bacteria or super bugs that can be deadly to people." Meanwhile, according to the Food & Environment Reporting Network (1/25), "a drug [ractopamine hydrochloride] used to keep pigs lean and boost their growth is jeopardizing the nation’s exports." Monsanto Attempts to Deny Proxy to Shareholder Activist: According to the Sacramento Bee (1/20), "on Tuesday, January 24, Monsanto officers and shareholders will vote on a shareholder proposal to create a study of "material financial risks or operational impacts" associated with its chemical products and genetically modified organisms (GMOs). The proposal represents one of the strongest signals to date that the biotech food conglomerate is facing growing consumer, legal, and regulatory uncertainties. As of today, however Monsanto has told John Harrington that they will not recognize his proxy who would speak on behalf of the resolution for only three minutes under normal circumstances. . . . Adam Eidinger, an organic food activist who recently led a walk from NY to Washington DC on behalf of honest food labeling, will present the shareholder resolution on behalf of Napa, California based Harrington Investments (HII) with help from the Pesticide Action Network of North America (PANNA)." 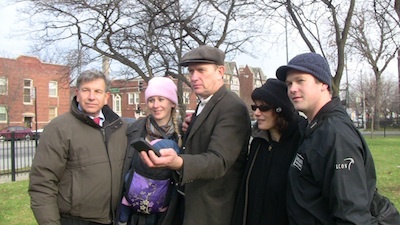 "Reinstating Local Food, Local Rules" (Care2, 1/19 - thanks to Jenny Huston!). Siena Chrisman of WhyHunger interviews Bob St.Peter, whom the Food Rights Network interviewed about local food sovereignty ordinances last year. "Liberia Among Top Five Countries Giving Farmland to Foreigners" and "National Elites in Developing Countries, Including Tanzania, Have Been Singled Out as Among the Most Notorious Land Grabbers": For more, see FarmLandGrab.org (1/12 and 1/8 - thanks to Jenny Huston!). Local Food and Self-Governance Ordinances, first drafted in four towns in Hancock County, Maine, are town ordinances establishing local food governance in response to increased federal regulation via the "Food Safety Modernization Act." Residents who drafted the ordinances in 2010 and 2011 feared that the new law, which President Obama signed on January 4th, 2011, could shut down cottage producers of jam and pickles made from backyard garden produce and church pot lucks without these local ordinances to protect them. Full text of the ordinance template, as passed in four Maine towns, can be found here. For the story of the drafting and passage of the original ordinances in Maine, read Bob St.Peter's interview here. This page was last edited on 11 May 2017, at 21:24.